Christmas Humphreys once wrote that all meditation styles could be categorized as either with ‘seed’ or without ‘seed’. With seed refers to giving the mind a completely absorbing ‘job’ to do that requires all of its attention. This type would be be represented by yantras, mantras, mudras, CDs, guided meditations, visualizations, etc. These methods although externally referenced are useful tools that lead toward inner stillness. The second type,without ‘seed’,can be likened to being in a room where a t.v. is on with a program in which you have no interest…. one detaches one’s attention from the subject matter of the mind chatter, rather than seeking to actually stop the inner conversations. A useful technique to understand the activity of the mind is categorizing,in which instead of getting caught up in the details of the minds activity, on takes a step back, so to speak, and classifies the general type of activity engaging the mind. For example, “My toe hurts.”, would become “mind chatter concerning itself with body sensations”. “My taxes are due.”, would become “mind chatter concerning itself with financial affairs”. Followed at each occurrence by gently bringing the attention back to the breath. Some seeded techniques using the breath, are very useful. One of the most effective methods is to focus the attention on the movement of the breath. One can then use as a concentration point the sensation of the breath moving past the opening of the nostrils, or the faint sound the breath makes as it passes the opening. A third method of this type is a technique which uses the sensation of the lungs filling and emptying with breath. These methods, although seeded, are internally referenced. These breath related techniques are plays on the ‘borrowed breath’ theme. Which considers the first inhalation at birth a borrowing of the breath, and our last act at the end of our lives the return of the ‘loan’, while during our lives enjoying its use. The characteristics of the breath indicate the state of our consciousness at any given moment. Excitement, anger, arousal, all modify the breath and a careful observer can tell much about the emotional or mental state of someone by paying close attention to the speed, rhythm, depth of his or her breath. One of the modern trends in meditation classes is timed meditation sessions, usually 40 minutes. However, obviously Buddha did not have a watch, or matches to light incense, so one might ask how did he know when to start and stop his meditation sessions. In our time little or no attention is paid during classes to recognizing when one needs to use meditation, but rather each session is set according to a time schedule. 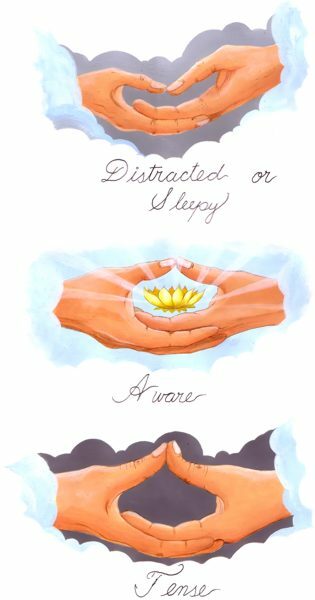 This is very useful as a training device, but tramples on one’s ability to recognize situations that call for meditation. Often, in classes, this final step of applying mind quieting techniques at the time they are needed, is ignored. One useful tool to aid in the refinement of meditation skills is hand positions. In one common method, the second joints of the middle finger are placed one over the other and the tips of the thumbs are allowed to rest with just the tips touching lightly together. The advantage of this method is that the thumb positions are an indication of the state of mind of the practitioner. If they droop the person is distracted or falling asleep. If they point up, from being pressed together too tightly, then there is an excess of tension. (see illustration) Observing the thumb positions is reminiscent of the idea that consciousness development can be likened to a guitar string…if too tight it breaks; if too loose it cannot play music; only with the proper tension can it make a beautiful, harmonious sound. For those who find lotus and half lotus sitting positions difficult or unattainable, the warrior pose, where one sits one the shins, in a kneeling position, may be more comfortable. Some find sitting on a chair is quite acceptable and meditation stools are now readily available.